Located right off of I-4 in the Seminole Hard Rock Hotel & Casino, Council Oak Steaks & Seafood, is an experience for a variety of reasons. First off, how about 100% U.S.D.A. prime? 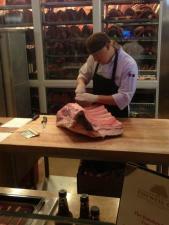 All dry aged 21 to 28 days, cut right in front of your very eyes at the butcher shop as you wait to be seated. I you don&apos;t believe me check out the photo to your right. If seafood is what you are in the mood for, you can sample any of the fresh fish, caught right here in Florida. The Alaskan King Crab legs are just one of many seafood delights that will have your mouth watering! I had the chance to stop by Council Oak for dinner for the first time recently, and I think I may actually still be full from this feast of plenty. Since it was my first time here, the server was kind enough to tell me the unique sorry behind the "Council Oak" in Council Oak steakhouse. All of this along with one of the more upscale atmospheres in Tampa Bay as, trust me when I say the service here is second to none. In terms of the entire foodie experience, a friend and I went all out and did the full experience, which I would highly recommend with a group of friends, as the portions are a plenty so don&apos;t hesitate to order and appetizer or even entree and pass it around the table. To kick off the evening we decided to go with a cheese tray assortment, which for me was good considering the smorgasbord of food I was about to order. Have a glass of wine, (for me it was Catena, Mendoza, Argentina, 2010) which I would highly recommend. Don&apos;t ask me to rate these meals, as they were all super amazing, and a little tidbit about the Council Oak Corn... they make it with bacon... yes folks bacon, which we all know makes everything better. If you haven&apos;t been to Council Oak, then definitely put it on your list for upscale Tampa Bay dining options in the area, as the menu, service, and atmosphere are second to none. I&apos;ll definitely be making return trips to give the seafood portion of the menu a try! If a full meal is not on your agenda, and you just wish to wind down in a relaxed atmosphere, visit to the COUNCIL OAK LOUNGE where you can listen to live entertainment nightly, enjoy the lounge menu and our superb specialty drink list or a fine cigar, Sunday-Thursday. That&apos;s it for now, but stay up to date for the latest foodie happenings and for more info on Tampa Bay restaurants, be sure to visit our website!